And just like that the magic of mid August occurs. New transplants to the area always ask “So how long does the heat last?” My standard answer is that it can be in the 90’s and bad from beginning of June until mid September but… in mid August the nights do begin to get cooler and the days get noticeably shorter. I think that it is just the little bit of optimism that is sparked when it is a few degrees cooler and heading in the right direction, towards fall. The battle with the weeds, particularly the crab grass, wears on. Some years, when the rains come just at the right time, the crab grass gets a foot hold and really takes over. We have been through the peppers several times pulling it out of the rows and the paths get mowed every week to keep it at bay. Even under the Big Tops, where you would think a lack of water would slow it down, it will get up to knee height before you know it. It is like the kudzu of the grass world, seems to grow a foot overnight. In fact the grasses are by far the worst of all the weeds. The broad leaved weeds are much easier to control and manage, they grow from the top of the plant. Grasses are far more cunning. Their new growth comes from down in the stem and when small, from under the soil surface making them much harder to kill with an easy cultivation. Only a few weeks left in the battle for this season, the troops are getting weary. Don’t forget the Terra Madre delegate Fish Fry fundraiser on Saturday at Johnny’s in Carrboro, starts at 6:00, runs until the fish runs out. Anna, Sarah and Sabrina have been working hard to prepare for this tasty event. Another event on the horizon is our first ever farm dinner with Bret Jennings at Elaine’s on Franklin on Wed. Sept. 8th. It will focus on peppers, especially chiles. Bret has spent a lot of time in Mexico over the years and does great things with peppers. The menu is looking really mouth watering. The flower season continues to wind down with limited quantities. Some nice Zinnias of course. Crested Celosia back with the last planting. Betsy’s beautiful bouquets. Plenty of fragrant Oriental Lilies in white and pink and the non-fragrant Asiatic Lilies too. Well last Saturdays roasting was a test in stamina, this Saturday looks like perfect weather. In hot types there are plenty of beautiful Anaheims and Poblanos (maybe the best we’ve had in years), Jalapeno, Serrano, Cayenne and Passilla. Cayennes and Habaneros for the incendiary among us. Padrone and Shishito, the Spanish and Japanese snacking peppers, just quickly coat them in a pan with some hot olive oil and sprinkle with sea salt and eat the whole thing. The Peregrine Picante Pimientos are back with nice red, slightly hot, thick fleshed fruit. In Sweet peppers we have good supply of Purple Bells, lime green Cubanelles and Corno di Toros. 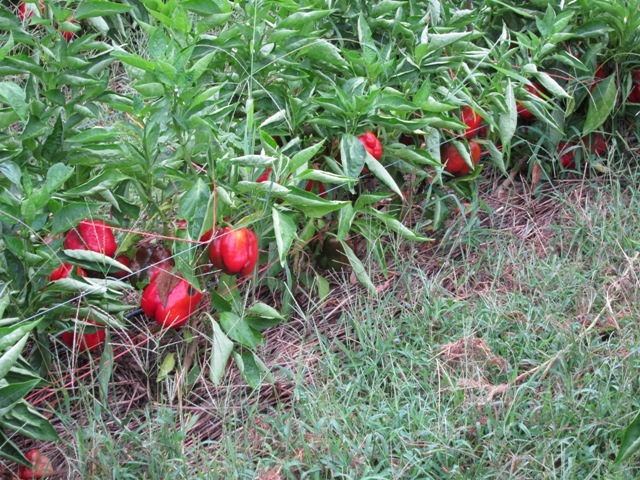 Looks like a good supply of Red Bells, with small amounts of Yellow and Orange Bells this week too. Tomato supply is light, too many worms working the fruit. In Reds there is a small supply of Big Beefs. Some Cherokee Purples from the last planting. In cherry types there is a pretty good supply of Sungolds, with a few pints of Grape tomatoes. There is a smattering of other colors around too. More of the awesome Italian heirloom Eggplant. Basil to go with tomatoes. The first planting of Summer Crisp lettuce succumbed to the heat and bolted, the next planting is still growing!